Chemical Constituents and Components : Main chemical components are piperine, rutin, beta- caryophyllene piperyline, piperoleines, piperamine, sabinene, chavicin, pinene, phellandrene, pentadecane, beta-bisabolene, linalool and limonene. Rutin: 1. It enhances the metabolic rate of body thus act as thermogenesis. 2. It increases the plasma concentration of coenzyme Q10. 3. It is a strong inhibitor of UDP-glucose dehydrogenase (UDP-GDH) 4. It exerts stronger effects on intestinal glucuronidation. 5. It stimulates the digestive enzymes of pancreas, enhances the digestive capacity and significantly reduces the gastrointestinal food transit time. 6. It protects against oxidative damage by inhibiting or quenching free radicals and reactive oxygen species. Piperine : 1. It is an N-methyl-d-aspartate (NMDA) receptor antagonistic, which contributes to its anti-convulsant property. 2. It causes decrease in total lipid contents by inhibiting enzymes involved in fat synthesis. 3. It is inhibitor of hepatic and intestinal glucuronidation. 4. It lowers the serum levels of both the thyroid hormones, thyroxin (T (4)), triiodothyronine (T (3)) and glucose concentrations with a concomitant decrease in hepatic 5'D enzyme and glucose-6-phospatase (G-6-Pase) activity. 5. It increases gastric acid secretion. Curing Diseases : 1. It is used to treat flatulence, gout, laryngitis, and paralysis. 2. 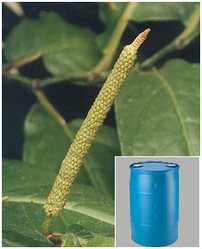 It is used to treat abdominal tumors and gastric ulcers. 3. It is improve the digestive system. 4. It enhances the immune system.